The hotel Castle Garden**** lies in the 1st district of Budapest, just a few steps from the famous tourist attraction of Buda Castle. The location of the hotel provides a cosy and peaceful place where guests can enjoy the vicinity of the nature in the heart of a teeming city. Our newly-built four star hotel which provides 39 air-conditioned hotel-rooms, a unique style restaurant with garden, a meeting room, a lobby bar, a refreshing mini-wellness centre and a garage, is an ideal venue for both tourists and corporate clients. The hotel offers 39 non-smoking and comfortable rooms decorated with soft colors and modern furniture with a focused on natural materials. -private bathroom with bathtub and shower, toilets, hair dryer; individually-controlled air-conditioning, individual electronic safe (fitted for a laptop), minibar, kettle, direct dial phone, cable and satellite LCD TV, highspeed Internet and free WIFI access. The newly-built hotel Castle Garden was designed by a famous architect and interior designer who focused on natural materials with the choice of furniture, the hand-made dried and pressed flower decorations. Also nearly 100 original flower paintings made by contemporary Hungarian painter called Istvàn Pàl Pintér are displayed and can be purchased at the hotel. Information to travel agencies : Vouchers not accepted. 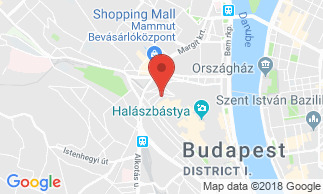 The hotel is situated in the 1st district of Budapest near the main tourist attraction of the Hungarian capital, the Castle district with the famous Buda Castle. The hotel is also close to one of the main junction point of the city, the Moszkva square where you will have access to the main public transportation network (bus, metro, tram).